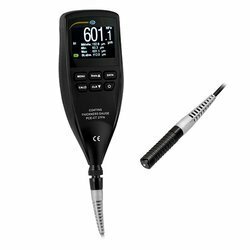 Our range of products include coating thickness gauges and coating thickness gauge. 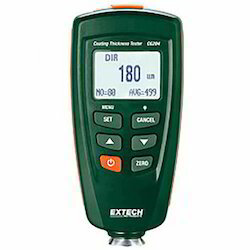 We are engaged in sourcing and supplying of a wide range of Coating Thickness Gauges. These are known for features like superior performance and easy operations. The offered Gauges are capable of analyzing the thickness of non-magnetic coatings on magnetic base, non-conductive coatings on conductive base, both ferrous & non-ferrous bases and others. We are also capable of offering Japanese and India make Hardness Testers. F type : For measuring the thickness of non-magnetic coating layers (aluminum, chrome, copper, ename1, rubber, paint) on magnetic substrate (steel, iron, alloy and magnetic stainless steel) - NF type : For measuring the thickness of non-conductive coating layers (ename1, rubber, paint, vanish, plastic anodic oxide layer) covered on non-ferrous substrate (aluminum, brass, zinc, tin and non-magnetic stainless steel). Measuring Principle : Magnetic Induction and Eddy Current. Built Probe (Integrated Probe).- Resolution : 0.1um (Under 100um) 1um (Over 100um) - Accuracy : ±1~3%N or ±3um. - . Data Output : RS232 Interface (Optional).- : Battery 2 Shutdown. Looking for Coating Thickness Gauges ?